"You've seen them in O'Hare. Not sure why these beef sandwiches aren't a nationwide craze because they're that good!" Cut notches all over the roast with a sharp knife. Rub with Greek seasoning, pepper, salt, and garlic. Cover and refrigerate for at least 4 hours. Bring roast to room temperature before cooking, about 1 hour. Tie up roast with kitchen twine so it will hold its shape while roasting. Mix beef broth and bouillon granules together in a roasting pan. Place roast on a rack above the broth so drippings will fall into the broth. Bake in the preheated oven until tender, about 1 1/2 hours. An instant-read thermometer inserted into the center should read 140 degrees F (60 degrees C). Tent with foil and let cool for 20 minutes. Pour broth into a saucepan. Bring to a simmer. Slice roast very thinly; dunk slices in the hot au jus and stuff into Italian rolls. Top with giardiniera. Ladle more au jus over each sandwich. 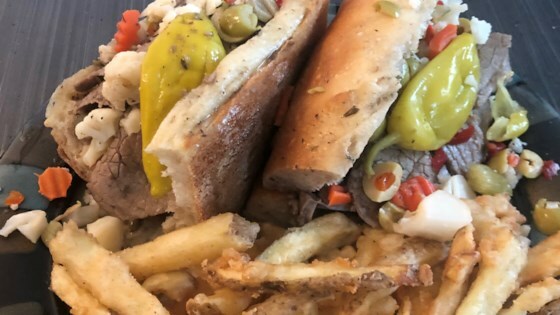 It’s Chef John’s tasty take on a classic Chicago-style beef sandwich. made this but topped with a provolone cheese sauce (white sauce with a package of sliced cheese melted in) YUM! !